Who is Trilogy Players Troubadours? 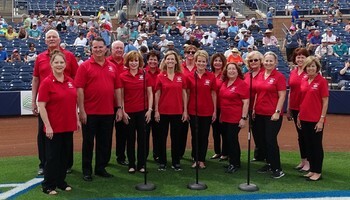 The Trilogy Players Troubadours is a mixed SATB choir comprised of members from The Trilogy Players Club at Trilogy in Vistancia. We sing at many public venues. You can find us singing the National Anthem at a Spring Training game in Peoria, or at the Mayor's annual State of the City address. We also take our holiday program on the road to public and private care facilities in and around the city. We rehearse every Wednesday evening from 6:30 - 8:30. Our rehearsals are held in a Trilogy member's home. Contact the Membership Manager for details. Trilogy Players Troubadours is currently on Winter Recess. We will resume regular rehearsals on January 9, 2019. Rehearsals are held from 6:30 - 8:30 each Wednesday evening at the home of one of our members. We welcome visitors to any of our rehearsals to see what is going on or to jump in and participate. For details please call Jane at 612-810-0023. We look forward to having you join us. 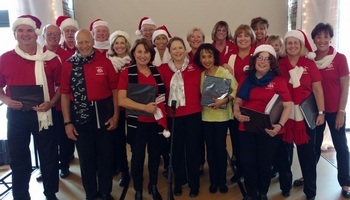 Want Trilogy Players Troubadours to sing at your next function? Why not hire Trilogy Players Troubadours to entertain at your next event? We can perform at corporate functions, charity events, community Entertainment events, birthday parties, christmas parties, awards nights, weddings, engagements, anniversaries, engagements, and even funerals and memorial services. An RSS feed (or news feed) is a means by which you can stay informed about what's going on at Trilogy Players Troubadours without having to regularly visit the website.